Naming a daughter due at Christmastime? But how about something subtle? The kind of choice that you might have embraced even if your daughter arrived in the heat of summer or on Halloween? Amaryllis – A flower associated with Christmas, more wearable than Poinsettia. Belén – The Spanish form of Bethlehem, making this one a Christmas place name. Emphasis is on the second syllable. Belle – As in jingle, though of course that’s not the original of the given name. Possibly a great middle name choice. Bianca – I’ll admit, I think Shakespeare before seasonal, but Bianca does mean white. Cadeau – She’s the French word for gift, an intriguing long form for Cate or Cady, and a gussied-up spelling that should be relatively easy to spell. Clara – A great vintage name remaining outside the Top 100, Clara is also the little girl in The Nutcracker. Clarice – One of my favorites – the girl reindeer in Rudolph, the one who likes him just the way he is, red nose and all. Trouble is that our generation tends to think Silence of the Lambs before stop-motion television holiday special. Esther – In at least some accounts, Esther means star. 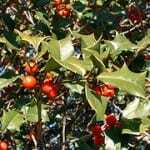 Holiday – There’s something joyful about Holiday, a name that shortens to Holly and Haddie. She’s the full name of Audrey Hepburn’s character in Breakfast at Tiffany’s – though that fact is not mentioned in the movie, only in the novel. Of course, Holiday works for girls born at many times of year. 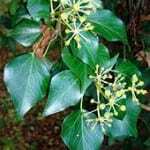 Ivy – Sure, Holly is the botanical name we think of first, but the traditional carol is “The Holly and the Ivy.” It’s an obvious Christmas pick that isn’t too obvious. Jovie – In holiday film Elf, Buddy falls for the good-hearted Jovie. It’s a cheerful choice and among the more modern Christmas names. Merry – Too much of a Christmas name? Maybe. But with noun names and virtue choices popular, Merry is as wearable as Mercy or Grace. Neva, Neve – There are plenty of names that mean snow, and Neva and Neve are two of the more subtle. Olive – She’s a name on the rise, and one forever connected to the hopeful aspects of the holiday, thanks to Olive, the Other Reindeer. This makes Olive possibly the only baby name ever boosted by a mondegreen. Ruby – Ruby red is a Christmas color, but it also used to be the birthstone for December. In the twentieth century, ruby migrated to July and August and Topaz was assigned to November. Snow – If Disney princess names and unconventional noun choices are both big categories for girls, why not Snow? One part White, one part seasonal celebration, Snow makes for an intriguing middle. Winter – Like Snow, she’s an unconventional noun name on the rise. Starbaby Harlow Winter Kate put this one on the map, and the success of Summer and Autumn paved the way for another seasonal pick. Zuzu – Another favorite of mine, Zuzu Bailey is the little girl in It’s a Wonderful Life. She evolved as a nickname for Zuzana or Zuzanna, Slavic spins on Susanna. You could use her as a short form for any Sue-name, from Susan to Suzanne to Suzette. Would you consider any of these Christmas names for a daughter born around the holiday? In the first spot, or the middle? I love Clementine, Gabrielle and Evangeline for the season. Not really unexpected but still nice alternatives to Noelle and Natalie (though I love both names, no matter how obvious). Noelle is my favorite and would have used it as a middle for first born if he had been a girl. First name would have been Dawn. Oh and another name combo to use is: Vola Snowflake, translate out from Latin to the fall of snowflakes. My neighbor’s sister was named Vola. Winter Ave Zoli, an American Actress/Model, famous for her short role on Game of Thrones, so their are two stars associated to the name Winter. -Snowdrop- translation means white snow and reverse it- it becomes Snow whites- Snow White original original name. For all Tolkien fans out there (I know there’s plenty of you). Anna is elvish for gift. A great addition to the list, Noelle – thank you! Natalie is the only name DH and I agree on at the moment and we’ve been through 100s of names it seems. I decided to look up the meaning of Natalie and most websites defined it as, “born on Christmas Day.” Figured this was a sign of what our baby girl’s name should be since she’s scheduled to arrive on December 24 🙂 I love it even more now. I’ve also liked Epiphany for quite a while. Little Effie (love this as a nickname). Though I’ve always liked Winter. And when I was pregnant, I had a dream that I’d named my daughter October, nickname Tobie. She was born in October, unexpectedly. Lucia or Lucy — It’s on Dec. 13, but I’ve always felt like St Lucia’s Day is the beginning of the Christmas celebrations. That Lucy means “light” is an added bonus. I would like to add Noelia! (No-ELL-ee-uh). It is the Spanish version of Noelle. I love the name Belen (Bethlehem). When I studied abroad in Mexico, I met women named Belen. It is often used as a double first name, like Maria Belen. It is pronounced like Beh-LEN. So beautiful! There is a Latin American Christmas carol about the little donkey of Belen. You can hear it if you listen to the Latin American Christmas channel on Pandora. It is a fun Caribbean song. Makes me love the name even more. I’m also very fond of Zuzu for Susanna. But I’m really looking forward to a possible boys list! I’ll second Douglas (I’ve been crushing on Dougal lately!) & Noble. Very handsome, that pair! Two of my friends who don’t know each other just had babies named Jovi(e). I’ve heard it in use, too. One of the co-founders of greenbabyguide.com named her daughter Jovi. Jovi arrived in June, though, so I’m not sure if Jovi was inspired by Elf. Her big brother is Roscoe, so maybe they just go for that o sound. Haddie is a cute nickname for Holiday. I also love Liddie/Lydie for her too. Love Belle, Olive, Ruby, Snow, & Zuzu too. Liddie works for Holiday – great thought! Will you do a boys list? My Top 2 boy name right now is Noble. I’m in love 🙂 We love Nobles as our Christmas tree (usually our go-to choice, but this year we have a Grand Fir which is a stunning tree and we were surprised on what a great tree we’d been missing out on!) so I think Noble would be a great Christmas name for a boy. Maybe add Douglas for the most common Christmas tree species. My mom’s name is Carol Joy, which my grandmother chose (in 1938), because she’d seen a list that said the meaning of Carol was “song of joy.” She put the two nouns together, and it gave my mom a unique double name. Many lovely names of the season. I find Cadeau particularly interesting, though ultimately I think I’d pass (love Cady names). Clara is lovely and sweet, Holiday has some solid nicknames and just the right amount of quirk, and Snow is a favorite of mine (if used likely stuck in the middle). Looking at my Virginia pine Christmas tree, I think Virginia has plenty of seasonal charm too, whether from the tree, the Virgin Mary, or the animated holiday movie “Yes, Virginia”. The nicknames Ginny and Ginger add a bit of fun to the name as well. I love this list! So many of them are on my faves list… I will go in alphabetical order. First I prefer Bell over Belle, but do agree she is not the unusual to hear anymore so sadly she probably wont get used by me. Bianca is a gorgeous name and I often think both Shakespeare and white. Holiday is one of my all time favorite names and is most definitly on my top 5 list, surprisingly she is also husband approved! I thought it interesting that Haddie could be used as a nn, I had never thought of that, I have also thought of Ollie and just Day. Neva is my grandmother’s name and my middle name! So she is definitely on the list too… I just love that name. Snow! I am over the moon about this name, but as it is so much like snow white who had porcelain skin, I would wonder if it was ill suited for a daughter of mine who will surely have dark skin. But I guess the same could be said for Bianca and Snow and I have no problem with those. Winter and December are probably right next to Holiday for me, with the problem that our last name ends in -er, but I love them so much I might just overlook this rule. I always think of Carol as well…as in Christmas Carols, but I think it was popular enough at one time that most people wouldn’t automatically think Christmas. From your list, I think Ivy, Bianca, Olive & Jovie are my favorites. I like that Jovie also sounds similar to Jovial which epitomizes the Christmas season. 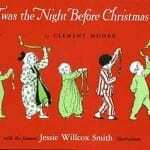 Esther also relates to Christmas in that she was the main character in Meet Me in St Louis played by Garland and sang Have Yourself A Merry Little Christmas. A great addition, Elizabeth – thank you! My friend just had a baby and in the spirit of the season gave her the middle name Bliss. I think it’s perfect considering the cheerful time of year and the absolute joy she will bring to her family! I like a lot of these! I do like Belen, Belle, LOVE Holiday, Merry and Ruby. We love The Nutcracker and went just last weekend. Where we live the girl is always Marie! I was confused when you said Clara so I looked it up. Apparently she is either Clara OR Marie! Fascinating. I guess you could add Marie to the list. What about Maria also? And Carol? Eve would be a beautiful choice for a December 24th baby. Anna and Elizabeth are also characters in the Christmas story if you want a more obscure choice. There are a lot of great choices!